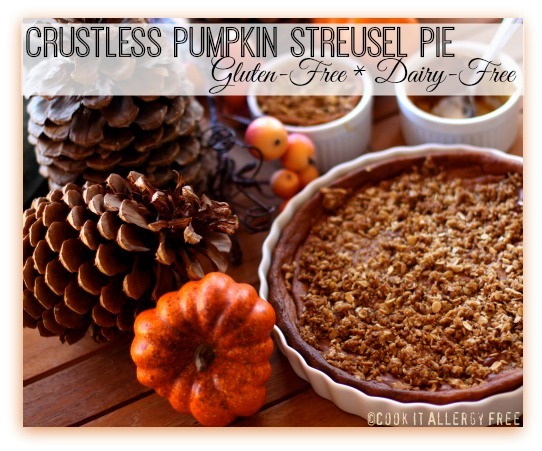 I feel that it would be criminal not to share my recipe for my Gluten-Free Dairy-Free Crustless Pumpkin Streusel Pie. This is a must on our Thanksgiving table. At least for the majority of our family. I do have one silly Uncle is who repelled by all things orange and squash related. So…he eats my Toffee Pecan Caramel Apple Streusel instead. But the rest of us, love to delve into this one. ¼ cup certified gluten-free oats (pulsed once or twice in food processor to break up oats slightly) or Quinoa flakes if unable to tolerate GF Oats. Heat oven to 350ºF. Grease pie plate (10 x 1 1/2 inches) well, getting into the ridges. In small bowl, mix all Streusel Topping ingredients until crumbly; set aside. Place all Pumpkin Pie ingredients in blender or food processor in order listed. Cover and blend until smooth. Pour into pie plate. Bake for 20 minutes until pie just begins to set up a little. Then sprinkle with evenly with Streusel Topping and return to oven for 30-35 minutes more. Once knife inserted in center comes out clean, cool about 20 minutes. Refrigerate about 3 – 4 hours or until chilled. Hi Jeanine! Yup! The Streusel topping puts a whole new spin on this pie! It is the best part! Is canned pumpkin the same as steamed pumpkin, or does it have less water content? I can’t get it anywhere in Australia. Hi Intolerant Chef! You can just bake or steam a pumpkin and then puree it in a blender for the same result. Fresh pumpkin is yummy in this pie! I was intrigued with your “opinionated uncle antics” but wasn’t able to access the link (sniff, sniff). In the meantime, I love the idea of a streusel topping for pumpkin pie. I’m getting a lot of little sugar pie pumpkins in my CSA box right now, so this is perfect timing. Your photos (as always) are gorgeous and really convey a wonderful fall feeling. Beautiful stuff over here at Cook It Allergy Free! Peace, love and pumpkin pie. Hi Melissa! Not sure why the link did not work the first time, but it works now. I fixed it. Yes. You have to love those family characters. It absolutely makes me feel like we are in a Woody Allen Film! LOL!! Thanks for the sweet comments about my pics, my friend! Pumpkin Pie are one of the things that my family is looking forward for Thanksgiving! Hi Food Trip Friday. Yes. Pumpkin Pie is one of my favorite parts, especially now that we have it back on our holiday table. I love the idea of this Kim! I’m really not a crust fan,but will take streusel anyday! Hi April! THanks so much for the comment on the photos! And yes, you are totally right! Everyone has an uncle norm! 😉 We love ours though! it looks so tempting and tasty. THanks Shydub!! And thanks for stopping by CIAF! Sounds delicious, and we have guests on Thanksgiving who are GF–thanks for this great recipe I can try out (and thanks for linking to Food on Fridays!). Hi Ann! Hope you and your GF guests enjoy the recipe! It is such an easy one to whip up (since you do it all in the blender) that you almost feel like you are cheating. Thanks for hosting Food on Fridays and for letting me be a part of it! Mmmmm this looks a-maz-ing! So trying the recipe this week- or as soon as I can find quinoa flakes (oats and I do not get along). Thanks a million for sharing! I have ordered my quinoa flakes online quite a few times (through Amazon, I believe) because for some reason they are hit or miss in the stores here. Hope you enjoy this one! Came here first, then headed over to Tia’s to read your guest post, commented, and now commenting here! I think we all have a little Uncle Norm in us, in one way or another. 😉 The struesel pumpkin pie looks delicious, at any rate! I’ll have to try a struesel topping next time I make pumpkin pie, which I make crustless anyway just about all the time (until I find a satisfactory pie crust I like, besides the gf puff pastry one I made). Thanks, Kim! Hi Zoe! Thanks for commenting both places. 😉 I want to try that gf puff pastry crust of yours. I think that it sounds amazing!! But you are right in that crustless pies are just great anyway. Plus they are so so easy! Thank you, Kim, though I must say that credit goes to Helene of Tartelette for creating the gluten-free puff pastry. It is amazing and so much better than any wheat crust my family’s had. This crustless recipe appeals to me. I do my apples in a crust free too, with a topping similar to yours. This is a must try recipe. Thank you for sharing it. Kim, that is one spectacular pie! You out did yourself again, my dear! Glad to hear that the full-fat coconut milk can be subbed one for one for the evaporated milk. I will definitely try that this year. 🙂 Off to read about Uncle Norm and then I REALLY am going to bed. 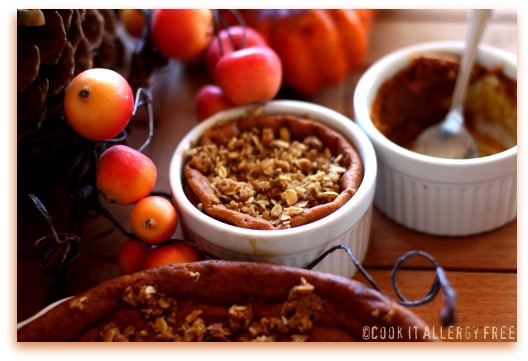 Thanks so much for adding this as a Thanksgiving Favorite for our Gluten-Free Holiday event! Shirley, thank you!! And the great thing about the Coconut Milk is that it does not make it taste coco-nutty at all. But I have made it with the evaporated milk as well and I do not find too much of a flavor difference at all (except that the evaporated milk makes it a little sweeter). And it definitely is a one for one (as long as you are using the full-fat coconut milk). Hope you get some rest! Do not over-do it – you are one busy busy lady!!! This is AWESOME, and your photos are gorgeous. I’ve made a crustless pumpkin pie, but Im a big fan of textures, and I bet this topping would be just the thing to make it really special. Looks so yummy! Any suggestions on how to enjoy this pie egg free? Any ideas to make this pie without the eggs? Hi Shauna! I would suggest that you try this replacement: For EGG-FREE: Mix together in small bowl: 3 Tbsp Unsweetened Applesauce with 1 1/2 tsp additional Baking Powder with 2 Tbsp Warm Water and with 1 1/2 tsp Ener G Egg Replacer – use this mixture when you would add eggs. So, would this be tasty without the struesel topping? I have a gf/cf son who loves pumpkin pie – except for the crust – and I don’t think he’d eat the streusel topping – he’s got quite a few texture issues. Incidentally, I have another son who will not eat anything orange – just like your uncle. That includes usual kid favorites squash, sweet potatoes, and carrots. Ironically, he loves green foods like spinach and broccoli (not usually kids’ favorites) – go figure. Hi, not sure I can find pumpkin pie spice in London. If I can’t, can I just put in spices from a regular pumpkin pie? I love your cornbread stuffing recipe from two years ago. The first year I made both but that one was so popular with everyone that didn’t bother making the regular stuffing last year. Enjoy your time in the kitchen this season! Thanks so much Kim. I’m doing early thanksgiving on Saturday this year. I figure we can’t do i ton Thursday anyway so why not early? So have a 2 page shopping list that I started on today. Your recipes feature prominently. 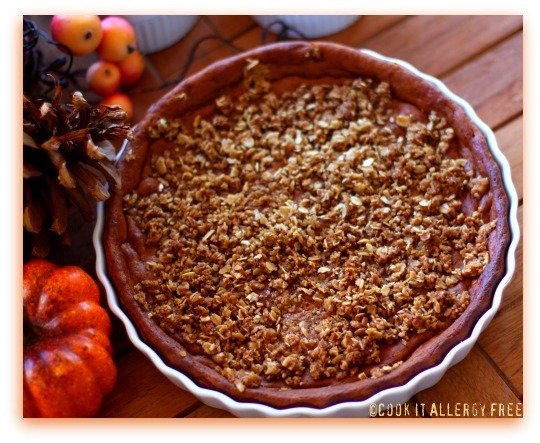 I have never been able to enjoy a good baked pumpkin pie with my egg allergy… I am excited to give this a try! Thanks for the recipe. I just discovered your website and am anxious to try your recipes. This time of the year is always so depressing for me as I went gluten free five years ago. I recently discovered that I am sensitive to egg, dairy, yeast, corn and several other things. I have been more depressed that ever knowing I can’t even cook my usual gf dishes. You have now given me hope! Thanks!